This card cannot be Special Summoned from the Deck. You can banish this face-up card you control; Special Summon 2 Level 4 or lower Normal Monsters with the same name from your Deck. Destroy them during the End Phase. 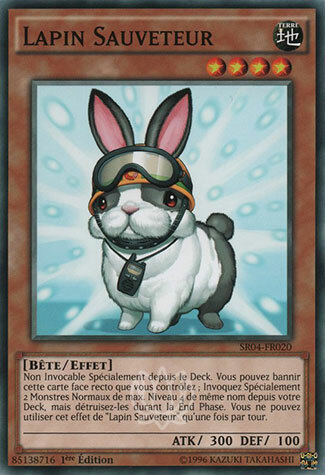 The effect of "Rescue Rabbit" can only be activated once per turn. 1514 decks jouent cette carte.